I’ve been using custom orthotics since 2008 and to be honest, even up till recently, I was still having to make adjustments. I’m no expert, so I trust my podiatrist and physios to tell me that I have quite a significant leg length difference. But even this information has been debatable by a few bike fitters I have come across. We’ll leave that for another time. The challenge I had was shaving off enough at the heel of my orthotics to give me enough heel grip. 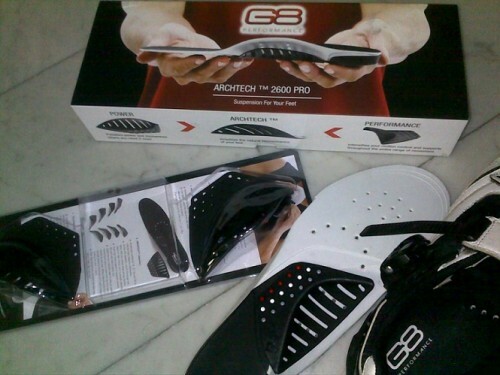 Some shoes that have silicon heel grippers inside which might help prevent heel slippage. Then a friend introduced me to G8 Performance Adjustable Arches. It comes with 4 different arch heights and has 28 different arch positions which makes it adjustable to almost any feet. It wasn’t hard to get the right position. The immediate feel I got was how stable my feet felt. There was very little to no movement of my feet within my shoe. In my opinion, stability is key in maximum and consistent force transfer. I’ve had them on for almost a month now and I’m extremely pleased with them. I don’t have any direct force numbers to justify their efficiency, but I no longer experience any pain or discomfort in my feet, which does mean I have one less thing to worry about. Try them out for yourself. Feel free to contact me if you’re thinking of getting a pair.